One of the injuries that I see increase in frequency during the winter months are foot and ankle fractures. Slippery conditions can trigger a fall, which is the usual cause of these injuries. Not only do falls occur during snowstorms or ice storms, but the snow or ice that gets left behind on sidewalks and parking lots will often result in twisting injuries around the foot and ankle that can lead to fractures. Winter sports such as skiing, snowboarding and ice skating also predispose patients to foot and ankle fractures. In fact, something called a “snowboarder’s fracture” is a specific injury that occurs because of the position of the foot and ankle on a snowboard. Foot and ankle fractures are some of the most debilitating injuries that we see in orthopedics. These injuries have both immediate and long-term effects. The majority of patients who sustain an ankle fracture will go on to develop ankle arthritis. The term arthritis means that there has been some damage or injury to the normal smooth cartilage in the joint. There are many conditions that can damage the joint surface, including an inflammatory problem (rheumatoid arthritis) or the long-term wear and tear of the joint (osteoarthritis). In the case of an ankle fracture, there is an acute and immediate traumatic event that leads to post-traumatic arthritis. This means that the patient will have some permanent mobility limitation and also some level of discomfort or achiness. While standing, the forces that ankles and feet experience can be up to 10 times the patient’s body weight and this can lead to severe discomfort if arthritis develops in those joints. There are many unique features about foot and ankle fractures that make them very different from fractures in other parts of the body. One very important thing to consider is which foot or ankle is fractured, because if it is your right side you will unable to drive for 2 to 3 months after the injury. Swelling can be a significant problem that may take up to a year to completely resolve. This not only leads to discomfort but may create some practical problems such as fitting into a normal shoe. Swelling can also lead to severe blisters that traumatize the skin around foot and ankle fractures. The blisters indicate that there has been severe injury to the skin, which can sometimes take several weeks to heal. Bruising is another feature that is very common around foot and ankle fractures—the result of bleeding from the bone that makes its way to the surface. Seeing a specialist with experience in foot and ankle trauma is extremely important in order to have the best possible outcome after a serious injury. Any individual’s treatment will depend on the severity and stability of their specific foot and ankle fracture. Most stable fractures are treated with a rigid cast, boot or shoe, and patients can begin walking immediately with some assistance. Some patients will need crutches, a walker or a cane first, until most of the pain resolves, and then, the treatment can continue in a fracture boot or shoe. Patients will usually benefit from physical therapy or a home exercise program after their fracture has healed since the period of immobilization will create atrophy. If the fracture is unstable, however, it will require surgical treatment with orthopedic implants, such as plates and screws. A cast or splint will not be enough to keep an unstable fracture in the proper position for it to heal appropriately. Patients are often upset by the idea of surgery, but it will provide immediate stability to the bone and may allow for a more predictable recovery. Bones, on average, will take 6 to 8 weeks to heal; the timeframe for healing does not change with surgery but quicker movement is possible because of the stability provided by the hardware. Two emergencies that require surgery are an “open fracture” (in which there is an open wound or break in the skin near the site) and a joint that is dislocated along with a fracture. Open fractures lead to a high risk of infection and they need to be cleaned and stabilized immediately in the operating room. Patients also will need to take antibiotics to prevent infection. A dislocated joint must be put back in place, or “reduced,” immediately and this is usually followed by surgery to keep the joint in position. It is often important to wait for swelling to decrease before proceeding to foot and ankle surgery. It can be dangerous to operate on swollen tissues because this may lead to an infection around the incisions after surgery. It is not uncommon for a patient to have to wait 10 to 14 days after a fracture has occurred for the actual surgery to take place. Many times, x-rays are the only studies that we need before surgery, but occasionally a CT or MRI is necessary to plan the procedure. Although foot and ankle fractures can have devastating implications on patients’ immediate quality of life, it is possible to return to many of the activities they enjoyed once the injury is healed. There may be a “new normal” in terms of comfort level during weight-bearing activities, and it may be necessary to use an orthotic insert or an ankle brace for some activities. There are some simple things that you can do to avoid foot and ankle fractures. Wearing appropriate footwear, such as winter boots with strong grip and ankle support, is a simple measure that can help you avoid injuries… avoiding unpaved walkways and surfaces without salt can also prevent slip-and-fall events… and looking out for black ice during extremely cold temperatures is another step you can take to avoid injury. 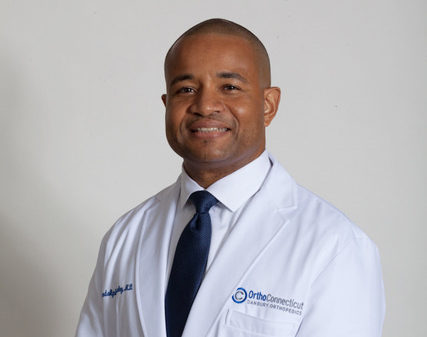 Dr. Randolph Sealey, who is fluent in Spanish, specializes in the field of foot and ankle surgery and is the only fellowship-trained orthopedic foot and ankle subspecialist in the greater Danbury area. He completed his fellowship training and gained his ankle reconstructive surgery expertise at the world-renowned Institute for Foot and Ankle Reconstruction at Mercy Medical Center in Baltimore, Maryland. In 2008, he became the recipient of the prestigious Roger A. Mann Award, the highest clinical research honor given by the American Orthopaedic Foot and Ankle Society. He is Board-certified by the American Board of Orthopedic Surgery. OrthoConnecticut I Danbury Orthopedics is the premier provider of orthopedic care in the region. Thirty-one fellowship-trained, Board-certified physicians provide care in nine office locations. The goal of the practice is to help patients regain mobility, lead active lives and attain optimal health. Offices are located in Danbury, Darien, New Canaan, New Milford, Norwalk, Ridgefield, Sharon, Southbury and Westport. To schedule an appointment with Dr. Sealey, or any of the physicians at OrthoConnecticut, please visit myorthoct.com or call (203) 797-1500.